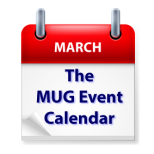 This week’s MUG Event Calendar highlighted by a presentation by technologist Bart Busschots to a Connecticut group. Final Cut guru Larry Jordan will visit California creative Pro group, and a Florida group will examine family calendar sharing. Los Angeles Creative Pro Users Group – We welcome back FCPX and Premiere Pro Guru Larry Jordan for what might be his final appearance at lacpug. Larry will tell us EVERYTHING you will ever need to know about Media Management in Premiere Pro CC & Final Cut Pro X. The 2016 winner of the Karen Schmeer Film Editing Fellowship is Eileen Meyer. Eileen joins us to talk about what this award is, how to apply and her career path.